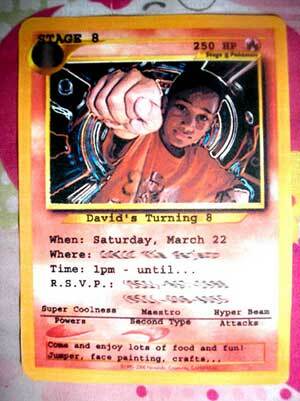 Make Your Own Pokemon Invitations. You can make some seriously cool pokemon invites like the one below which was submitted by one of our readers. You will need your own graphic editing program. The best one is Adobe Photoshop or Adobe photoshop elements (the cheaper version for us non-pros) but you can use your MSPaint program which you get free with your PC (usually) or for the Mac users Appleworks. How do you make one? There is a step by step tutorial on this site http://www.fakecard.com/ which shows you how to make your card for free. How cool is that! So now all you need to do is take that power pose photo of your child and get faking. Make sure you share your invites with us. We'd love to see what you can do!! The invites I made for my brother's 8th birthday. I got the Pokemon card blank from www.fakecard.com and the rest was done with photoshop.